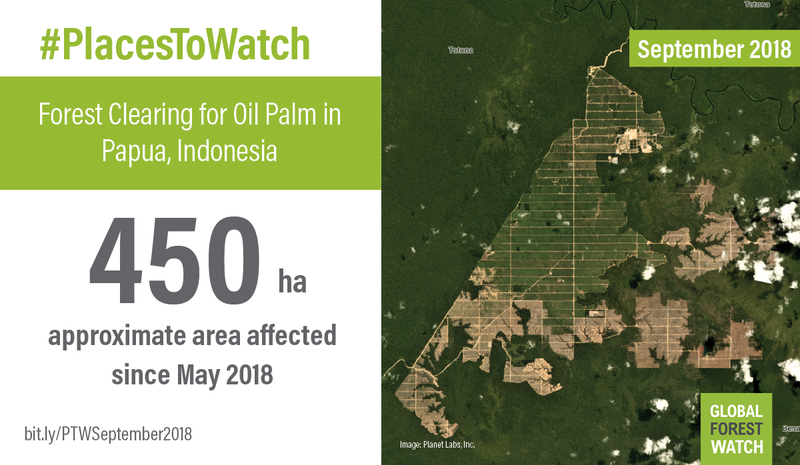 Places to Watch is an initiative that uses weekly GLAD alerts on Global Forest Watch to spot changes in forests around the globe and identify the most consequential cases of recent deforestation. By pairing deforestation alerts with expert interpretation of satellite imagery, credible descriptions of what is happening on the ground and resources to learn more, we hope to galvanize action to prevent further forest loss. Sign up here to receive each quarterly edition of Places to Watch. This edition of Places to Watch examines three forest-clearing hotspots in Brazil, Indonesia and the Democratic Republic of Congo. The approximate areas affected are based on satellite detection between May 1, 2018 and July 31, 2018. However, due to occasional cloud cover that can obscure satellite recognition, some loss may have occurred earlier. 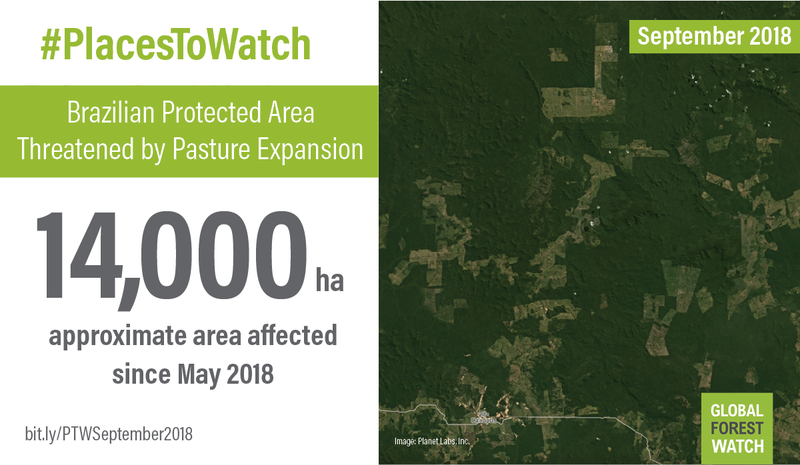 More than 14,000 hectares of Brazil’s Triunfo do Xingu Area of Environmental Protection were affected by the expansion of pasture since May. The total area of tree cover loss within the protected area since 2006, when it was established, is more than 350,000 hectares, equivalent to around half a million football pitches. The new clearing comes at a time when the Brazilian government has declared success at meeting its 2020 climate goals related to deforestation. While Brazilian deforestation has decreased significantly over the past 15 years, the clearing in Triunfo do Xingu and elsewhere in the Amazon indicate that the battle against clear-cutting of primary forest is not over. Unlike in other Brazilian conservation areas, regulation and enforcement within “Environmental Protection Areas” is quite weak, allowing for some private use which makes these areas more of a target for ranching and land-grabbing. However, private use of land inside the area still requires a license. Most of the deforestation within the area is illegal, according to Maria Bentes, the Conservation Unit Manager for the Administrative Unit of Xingu, which includes Triunfo do Xingu. “The areas licensed within the Environmental Protection Area are few and insignificant compared to the immensity of the area,” she said. Triunfo do Xingu is split across the São Felix do Xingu and Altamira municipalities in Pará, with the first- and third-highest area of tree cover loss of any municipalities in the Brazilian Amazon, respectively. São Felix do Xingu also has the second-highest number of cattle of any municipality of Brazil. With its vast tracts of unclaimed land, it’s perhaps unsurprising that Triunfo do Xingu would become the target of pasture expansion. The destruction in Triunfo do Xingu has been featured in articles from Brazilian NGOs Instituto Socioambiental and Imazon. With just 20 forest inspectors for the entire state (an area 1.5 times the size of Texas), government capacity is insufficient for the enormous market incentives to deforest. “It’s an unequal fight… it's absurd what they manage to devastate in such a short period of time,” said Everton Barros Dias, Forest Oversight Manager of Semas. GLAD alerts detected approximately 450 hectares of forest clearing since May inside the PT Permata Putera Mandiri (PPM) concession in Western Papua. PPM is a subsidiary of ANJ Group, which is a member of the Roundtable on Sustainable Palm Oil (RSPO). While the clearing is likely legal – it is within a concession and the land is zoned for utilization – it would seem be in breach of the no-deforestation policies of many of ANJ’s customers. This is not the first time ANJ has come under scrutiny for deforestation in the PPM concession. Greenomics-Indonesia published a report in 2015 on large-scale clearing in PPM and a neighboring ANJ Group concession. Musim Mas, Wilmar and Golden-Agri Resources suspended purchases from the ANJ group as a result. Clearing in PPM paused after the publication of the report, but resumed in late 2017. Small yet rapid clearing has affected approximately 500 hectares within the Democratic Republic of Congo’s (DRC) Virunga National Park. The clearing appears to be caused by charcoal production and small-scale agriculture, which puts pressure on resources within North Kivu province. Although quite decentralized, the charcoal industry is hugely important in DRC. Electricity is not readily available for most, so charcoal is used as a primary source of energy throughout the country, including for cooking. Virunga’s forests are a key source of charcoal for the densely populated province of North Kivu. The nearby city of Butembo has an estimated population of 900,000, but political insecurity and recent outbreaks of Ebola have caused many residents to flee to nearby villages in and around the park. Militia groups, much like those connected with the temporary closing of the park earlier this year, have taken advantage of this increasing demand by threatening violence against producers who don’t forfeit portions of their charcoal profits to the groups. Virunga National Park is home to many of the world’s last mountain gorillas and other rare wildlife and plants. Numerous efforts are in place to decrease both the supply and demand of charcoal throughout DRC. To stay abreast of more developments in the world’s forests, sign up to receive each quarterly edition of Places to Watch straight to your inbox, and read our blog post for more detail on how we spot and select these at-risk areas.